Since the 1950s Shepparton has been one of rural Victoria’s largest cities. Its site, in the Goulburn Valley, at the junction of the Goulburn and Broken Rivers, along with extensive irrigation works in the early decades of the twentieth century, gave rise to two nationally known brands of tinned goods, Ardmona and the Shepparton Preserving Company. Readily recognised by its SPC brand, by the late 1930s it had become the largest fruit processing plant in Australia. Shepparton grew rapidly in the early post-war years, with the Victorian Housing Commission building over 1000 houses, many occupied by incoming migrant from southern Europe. SPC, as the city’s major employer, accounts for well over 2000 jobs in manufacturing the fruit supply. SPC and Ardmona were merged in 2002 and acquired by Coca-Cola Amatil in 2005. In 2014, with support from the Victorian Government, Coca-Cola Amatil pledged a new round of investment, and signed a large supply deal with Woolworths, which appeared to confirm the operation’s future. Shepparton, a rural city in northern Victoria, is situated in the Goulburn Valley at the junction of the Goulburn and Broken Rivers. Shepparton is 160 km north of Melbourne, via the Hume and Goulburn Valley Highways or via the railway to Tocumwal. The site of Shepparton was included in the Tallygaroopna pastoral run which was taken up in 1841 and transferred to Sherbourne Sheppard in 1843. Sheppard’s homestead was the most prominent building in the district. When gold was discovered in the Ovens district of north-east Victoria intending miners had to cross the Goulburn River. Pat Macguire operated a punt to cross the river, and the location of the crossing was the genesis of a settlement. By 1853 there were a few buildings and a government animal pound. From being called Macguire’s Punt the settlement became known as Shepparton (after Sherbourne Sheppard) in 1853. The Shepparton town site was surveyed in 1855. In the 1870s large pastoral runs were subdivided for farm selection, and between 1871 and 1881 Shepparton’s population increased from 33 persons to over 1000. A flour mill, a store and John Furphy’s foundry were opened in 1873. (The Furphy water carts gave rise to the expression ‘a furphy’ in World War I, meaning a misleading rumour, which arose from water carts failing to arrive for thirsty troops. Joseph Furphy, the proprietor’s brother, wrote ‘Such is life’ at nights after working at the foundry). A Methodist church was opened in 1874 and a school in 1875. 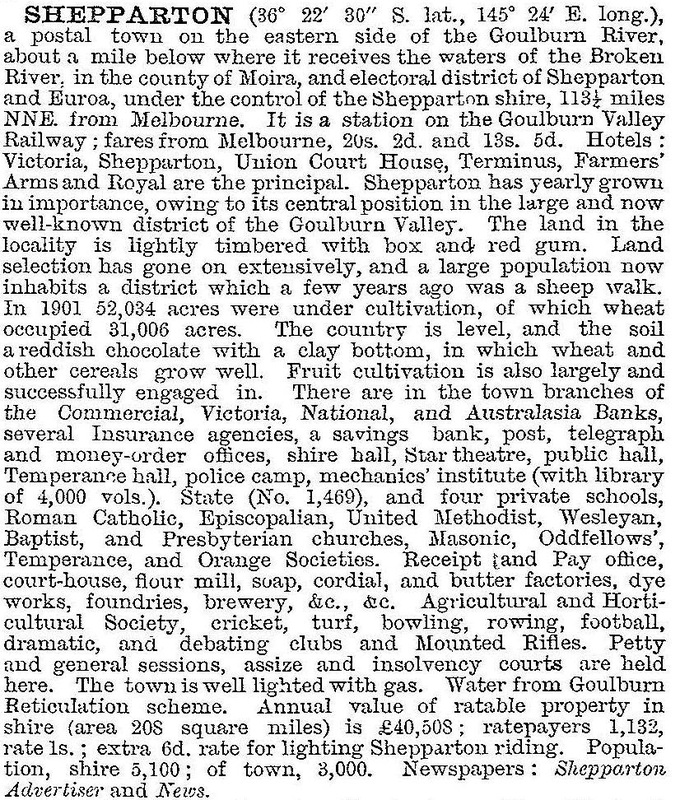 Shepparton came under Echuca shire (1865), and the Shepparton district became a shire in itself by severance from Echuca in 1879. 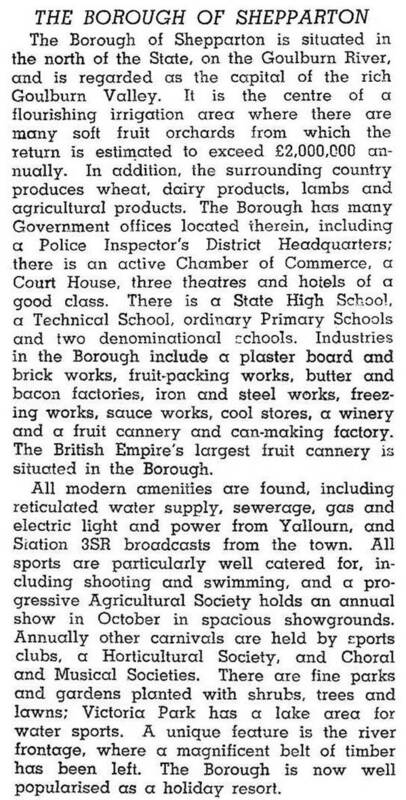 The growth of the township awaited separate municipal status until made a borough on 31 May 1927. Until the railway line was extended from Seymour to Shepparton in 1880 the main agricultural output (wheat) was transported by road or river boat from Shepparton. Shortly after then a local waterworks trust was formed, and in 1886 the building of the Waranga weir upstream on the Goulburn River was authorised. Shepparton’s first large orchard was planted in about 1884 and watered by pumping from the Goulburn River. Vineyards were planted in nearby Mooroopna, relying on rainfall only. In 1886 the Ardmona orchard was planted, the forerunner of a fruit growing settlement. Dairying was taken up and a butter factory was opened in Shepparton in 1894. In 1909 the Waranga water storage basin was completed by the State Rivers and Water Supply Commission (1906). Four years later the Commission announced the objective of closer settlement in irrigation areas, and in 1911-12 it was given control of closer settlement, along with the subdivision of land for irrigated holdings (1913). The Commission began its settlement at Shepparton East in 1912, which became the location of most of Shepparton’s orchards. The Shepparton Preserving Company began in 1918 and the Commission’s second settlement at Lemnos began in 1920. Other irrigation settlements around Shepparton were Grahamvale (1910) and Orrvale (1912), and a village settlement was established north-west of Shepparton near the present golf course. It had an estimated population of 400 in 1930. Between 1947 and 1966 Shepparton’s population doubled. Four State primary schools were opened, doubling the number in the district, and a technical school (1953) and a girls’ high school (1960) took pressure off the high school which had begun as an agricultural high school in 1909. 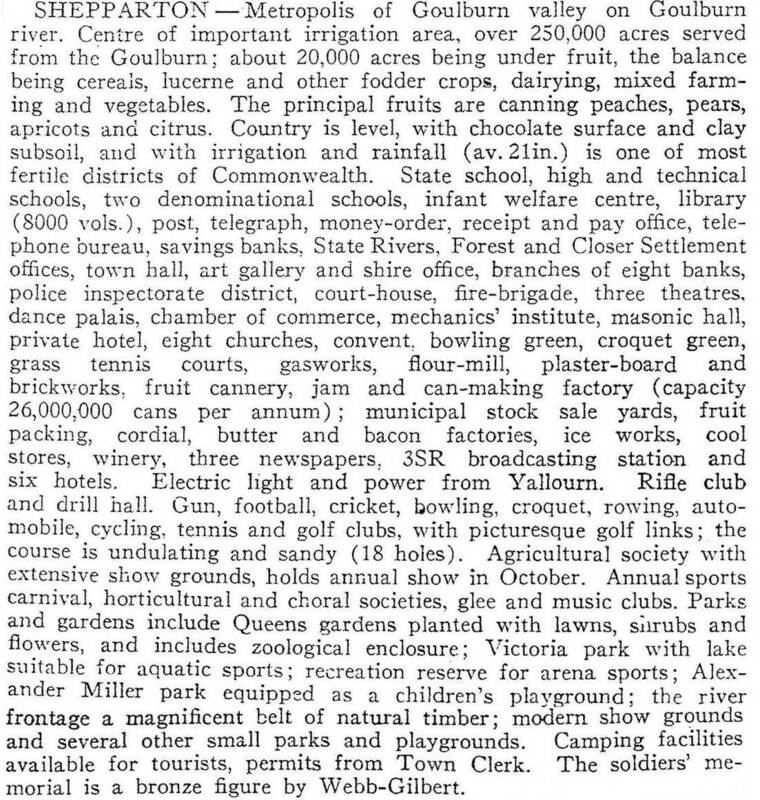 In 1955 the Shepparton town plan was approved by the State Government (the first in rural Victoria) and the Raymond West swimming pool was opened. The pool is a large one, near Lake Victoria and extensive parklands that join the town to the Goulburn River. Raymond West was a long serving town clerk who was identified with Shepparton’s planning and postwar growth. For over 100 years immigrants from southern Europe have settled in the Shepparton area, and immigration to Shepparton was strong during the postwar years. In 1981 11.5% of Shepparton’s residents were born overseas, of whom nearly one third were born in Italy. A Muslim mosque was opened in 1960. The Aboriginal community established the Rumbalara village in 1958. Shepparton has a strong role as a manufacturing and district service centre. In 1966 there were the Shepparton Preserving Company (200 to 1100 employees, depending on the season), Anderson Meat Industries (465 employees) and the butter factory (75 employees). There were over 460 shops and commercial premises in the business centre. In 1985 Shepparton’s retail floorspace was nearly 100,000 square metres with an annual turnover of $294 million, 41% of the Goulburn region’s turnover. The Shepparton Preserving Company cans mainly pears, peaches and tomatoes. Over 80% of its shares were held by fruitgrowers who took company profits through fruit supply prices. In 1990 the company faced heavy losses. The board was restructured: employees took short term wage reductions and the company revived. It was merged with the Ardmona Fruit Preserving Company in 2002. Shepparton city had 86 manufacturing establishments, 425 retail establishments and a workforce of 9677 at the beginning of the 1990s. About one quarter of the workforce was in the wholesale/retail sector. In the education sector there are a campus of LaTrobe University, the Goulburn Ovens Institute of TAFE, the Goulburn Valley Grammar School, three State secondary colleges, a Catholic primary school and six State primary schools. Shepparton had 17 hotels and motels with 1386 bed spaces in 1995. Caravan parks and the camping ground had 589 sites. Its dependence on tourism extends to the Goulburn Valley hinterland with water sports and recreation, local orchards and wineries, and visits to State forest reserves and wetlands. The Shepparton Festival is held in March and the agricultural show in October. In Shepparton itself there are the riverside parks and forest reserves, the SPC factory, the shopping centre and a regional art gallery. Shepparton’s dependence on its hinterland was evident from the formation of the Shepparton Kyabram Rodney Development Corporation in 1990. There is a regional livestock saleyard east of the city. Wanganui homestead, 6 km north-west of Shepparton was built in 1906 from locally made bricks. Its grounds are notable and it is on the Australian and Victorian historic buildings registers. It accommodates the Institute of Technical and Further Education. On 18 November 1994, Shepparton city, Shepparton shire, most of Rodney shire and parts of Euroa, Goulburn, Tungamah, Violet Town and Waranga shires were united to form Greater Shepparton city. It has an area of 2420 sq km, compared with the former Shepparton city of 27 sq km. Since the 1960s Mooroopna, west of the Goulburn River, has been an increasingly urban area contiguous with Shepparton. During the 2000s Kialla became a contiguous urban area south of Shepparton.